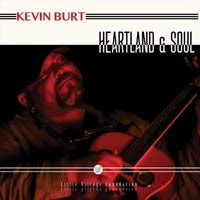 I just had the opportunity to review the most recent release, Heartland & Soul from Kevin Burt and it's quite entertaining. Opening with Day Day, a funky R&B track with really nice vocals by Kevin Burt . backed by Jerry Jemmott on bass, Derrick DMar Martin on drums, Kid Andersen on guitar, Jon Otis on percussion, Jim Pugh on keys and with Lisa Leuschner on backing vocals, this is a great opener. Thank You is a solid soul track with a great set up. Rhythmic rim shots and a warm bass line set the pace on this one that does a sideward salute to Sly's Thank You (Falettinme Be Mice Elf Agin). Working this track over and over, Burt really milks the soul out of it. Very nice. I really like the soulful movement of Real Love and it's traditional R&B vocal phrasing with solid harp work by Burt. A slower, almost folksy take on Lennon & McCartney's Eleanor Rigby reminds me of Richey Havens and that's good. Unsung vocal hero. Never is a super bluesy soul track with some of Burt's best vocals on the release. With a great bass lead by Jemmott and nice guitar lead by Kid Andersen, this is one of my favorites on the release. Wrapping the release is blues shuffle, Wake Up, Baby with Burt on acoustic guitar, vocal and harp. Burt is an entertaining musician, solid singer songwriter and makes a cool album. Check it out.